These are the necklaces that we currently have on hand. If you prefer to have one specially made, there is no additional charge unless the stones or beads have increased in price. Please check in often, as we will frequently update the product pages with new items. 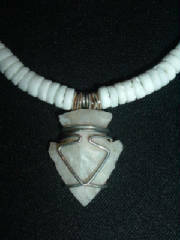 Our arrowhead pendants are tied with silver coated wire. Each has a unique design from Andrew Tapia, who hand-knapped this flint arrowhead. 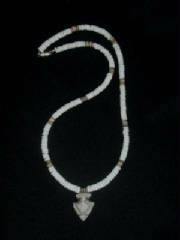 Necklace is 21 inches long with a lobster clasp. Arrowhead is 1.5 inches in length and 3/4 of an inch in width. 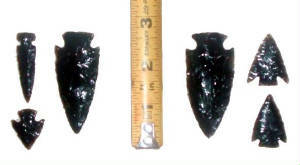 Obisidian arrowheads of different sizes -- call for a quote!